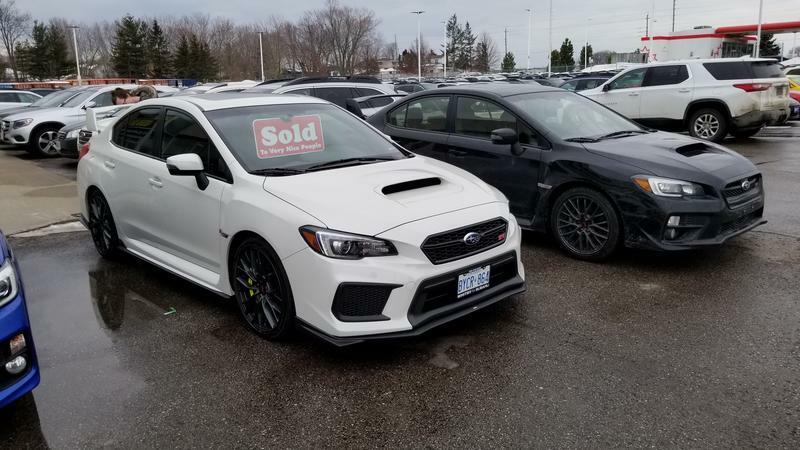 We traded our 16 last Friday for a 19 model, while on paper the differences are very very small, but holy crap it drove like a different car, it was much much smoother in general, the shifter feels smooth, the clutch was nice, cabin is quiet, the headunit is much more usable. Overall, we are very happy with it, it's a shame we are not getting S209 in Canada thou. When did the STI get the thicker glass, 16' or 17'? Should be a good comparison. Anyways its a great looking new car! Did they? well, that explains A LOT on the quietness, sometimes during winter months, you can hear strange sound coming from the windshield as driving down the roads and it has been doing that since new, dealer couldn't find anything wrong with it so we let it be, where as the white car is whisper quiet. I thought that was 18? Also, some of the cabin quietness and smoothness is probably just that it's a new car. Still, congrats on the upgrade (and I'm very jealous of the headunit)! I know randomly my car does something similar. I believe its the dash rubbing against the windshield but I can't be sure. Actually I think you may be right. My 05 has done that since the day I bought it in 2012. I have Sorbothane scraps stuffed in there. Ugly but stopped the noise. Thin windshields were introduced with the WRX in 2004? Done for weight reduction but the approved glass cost more, not less. Going thicker my be a downgrade, not an upgrade - I am unsure of today's technology - 2004 was 15 years ago. The phrase improved ride makes me wary. We all know an STI's ride could be improved - easily. It wasn't something many of us wanted if it means any decline in handling. Many of us mod and knowingly trade comfort for handling. If someone's description of a mod sounds to good to be true, it probably is !!! Last edited by mheyman; 04-11-19 at 04:08 AM. Nope, the tech hasn’t changed, just the marketing. In 2004, it was the hot car, competing with the Evo. Now the only competition it has are the Golf R, S3, etc - so adding a bit more daily driveability is the goal. I’ve had a 2004, a 2013 hatch, and a 2018. In terms of handling, the 2004 was an absolute beast, the 2013 was solid, but never particularly awe-inspiring, and the 18 was mostly a return to form. Definitely did not have the sharpness of the 2004, but the substantially better steering rack and chassis stiffness make up for 95% of it. The new car really isn’t a ton heavier, and, while reasonably comfortable, it is still pretty damn stiff. The 2004 beat the living heck out of me when commuting, the 2018 still had plenty of edge, without wearing me down. Last edited by DarkSi08; 02-20-19 at 10:00 AM. In terms of handling, the 15+ runs circles around an 04 thanks to the updated chassis and suspension. The track time differences are fairly dramatic. Don’t forget that Subaru also deleted the air tube that routes in noises from the engine bay on the 18+ cars. Perhaps that also contributes to the quietness in the car.